Choose the right costume. Kids should be wearing flame-retardant costumes that do not restrict their movement. The costume should hit your child around their ankles, it should not be hanging or dragging on the ground for your child to trip over. 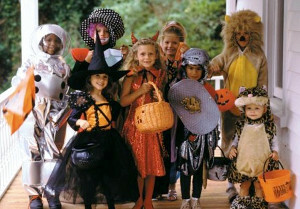 Your child should be able to move just as fast in their costume as they can in their regular clothing. If the costume is not warm enough for a chilly fall evening, make sure it is large enough for a layer of thick clothing underneath. Particularly for younger kids, choose a costume that is brightly colored or light colored so that you can spot them easily in the dark. Use reflective tape to make dark costumes easier to see. Kids may choose a costume by any number of criteria; make sure that you, as an adult, handle the safety aspect of costume selection. Choose proper accessories. Give kids glow sticks or necklaces. They will have a lot of fun, but this is also an important safety measure. Select shoes that are easy to walk in, and remember that your children will be outdoors, on the street, at night. A pair of high-heeled princess dress up shoes may go perfectly with the costume, but your little one will be complaining long before the night is over. Any masks or headpieces should not restrict their vision or hearing; consider face paint instead of a mask. Stay with your kids. An adult must accompany the children, and they must stay together as a group. Even on Halloween, it simply isn't safe to let young children wander around outdoors alone. If you allow older kids to go trick or treating in a group without adult supervision, remind them of safety tips like staying on sidewalks rather than walking in the middle of the road, obeying all traffic signals, staying together, and never entering anyone's home or vehicle. Consider giving them a personal alarm so that they can easily alert nearby adults if someone bothers them, and don't forget to make sure they have a cell phone and a flashlight with working batteries. If there are dogs in the neighborhood, a keychain canister of pepper spray can keep attacking dogs at bay. Agree on a route and a curfew before they leave. All trick-or-treaters should stick to an area they know well, and only approach homes with well-lit entrances. Safeguard your home. Halloween is a unique opportunity for criminals. They assume that anyone who is home will open the door, which makes it easy for them to find unoccupied homes. With so many people out and about, someone outdoors at night will not arouse as much suspicion. If you won't be home this Halloween, consider a house sitter, and double check that your doors and windows are all locked. Arm your window and door alarms to catch anyone who does try to break into your home on Halloween eve. Of course, safety doesn't just mean keeping your home safe from criminals; your home should also be safe for pets and trick-or-treaters. If you have animals that may become excited at the sound of the doorbell, keep them secured. Remove any obstacles between the road and your front door to avoid tripping any trick-or-treaters. Inspect the treats. Although there is certainly some media hype surrounding the doctoring of Halloween treats, the truth is, it is possible. Inspect your kids' Halloween treats before they have time to eat any of the candy. Look for unwrapped pieces or pieces that look to have been re-wrapped by hand, and discard any that do not look safe to eat. With all of the excitement surrounding Halloween, it's easy to forget basic safety rules. These tips will keep your family safe this Halloween, whether from the cold, from tripping, or from anyone who may bother you or your home. At ResistAttack we feel that children are our most important treasures why not check out our Child Safety section you'll be glad you did!